We left Calvi after buying breakfast from town and refuelling as it is 50 cents per litre cheaper than in Sardinia. We made our way north eastwards towards the bottom of the tip of Corsica. Winds were yet again light but we did manage to hoist the cruising chute for a while and have evidence to prove it! We arrived at Saint Florent just before 6pm and after mooring up found out that the showers were closed for the evening. Mind you, they wanted €2.30 each for the privilege on top of the overnight rate of €66! After a chicken tagine on board, we went for a wander along the front. 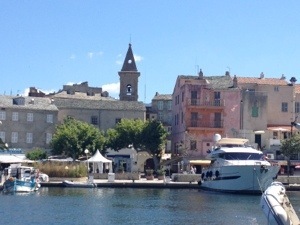 It’s a pleasant enough town with an ancient citadel but it certainly wasn’t as interesting or charming as Calvi. However, it served our purpose as we thought there was going to be some high winds overnight that didn’t happen but it was good to fill up with water. 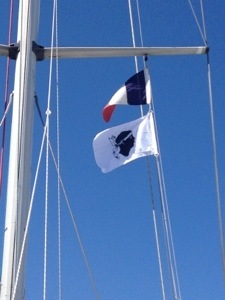 Today, having hoisted the Corsican flag – a present for Nimmie from the Colins – we had a 30nm trip over the top of Cap Corse to the east coast of Corsica. The Corsican flag represents a Moor’s head, taken from the Aragon arms representing a defeat of the Saracens and first used by Corsican rebels in the 18th century. 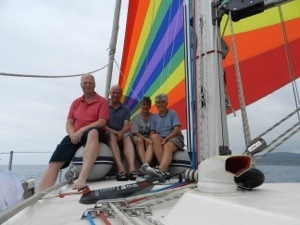 We managed to sail for most of the day but the swell made for an uncomfortable passage for a couple of hours. We had a cracking sail initially then had the engine on for a while and then were able to goose wing for the rest. Goose winging is when you have the wind directly behind you so you have a sail on each side. We arrived near Macinaggio and found a bay just south of it that looked good from the pilot books but on arrival decided that it looked more like a set from a war movie with deserted or shut up houses and derelict towers! 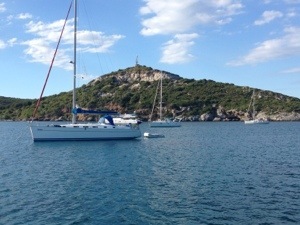 We went a couple of miles north back to Macinaggio and anchored just outside the harbour in a lovely bay with sandy beaches and a hilly back drop. The wind is supposed to pick up tonight but we should be fine tucked up into the bay. Pictures below of the four if us with the cruising chute, the Corsican flag, Saint Florent, goose winging and Macinaggio.